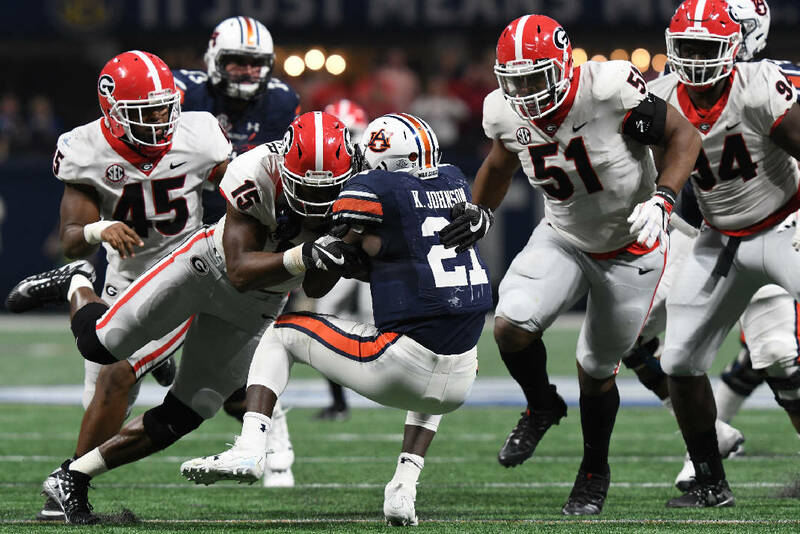 Georgia outside linebacker D'Andre Walker (15) stops Auburn tailback Kerryon Johnson during last December's Southeastern Conference championship game, which the Bulldogs won 28-7. ATHENS, Ga. — There are certain statistics that seem to go with certain rivalry games involving the Georgia Bulldogs. Georgia's 36-17 triumph over Florida late last month marked the 13th consecutive year in which the team that has rushed for the most yards has won the annual showdown in Jacksonville. Rushing offense doesn't have the same decisive impact for Georgia against Georgia Tech, though — two of the past three series victories by the Bulldogs have occurred despite them being outgained on the ground by the triple-option Yellow Jackets. "Time of possession, as long as you're scoring points, is not that big a factor," Auburn coach Gus Malzahn said this week. "It is a factor when you're not able to score points." Alabama has proven the first part of Malzahn's statement this season, with the undefeated Crimson Tide ranking first nationally in points per game and 36th in possession time. Auburn, however, is reflecting the second part of his comment. Malzahn's tempo-oriented Tigers are a wretched 124th nationally with an average possession time of 26 minutes and 31 seconds per game. Auburn had the ball for less than 26 minutes in its 30-24 home loss to Tennessee on Oct. 13 and less than 25 minutes in its 22-21 home loss to LSU on Sept. 15. In Auburn's 23-9 loss at Mississippi State on Oct. 6, the Tigers had an embarrassing 18:07 in possession time. Even in last Saturday's 28-24 win over Texas A&M, Auburn had the ball for 21:19 but awoke from six consecutive three-and-outs with two late touchdown drives engineered by junior quarterback Jarrett Stidham. The comeback victory enabled the Tigers (6-3, 3-3 Southeastern Conference) to enter the College Football Playoff rankings at No. 24, but they are two-touchdown underdogs against No. 5 Georgia (8-1, 6-1) largely due to their offensive ineptitude. "It's going to be a big emphasis to handle their tempo on first and second down," Georgia junior safety J.R. Reed said. "We've got to handle that, because when those guys get in third-and-short, that is when they like to go really fast. When they keep getting first downs, they like to go really fast." Time of possession tends to accompany a strong running game, but Auburn's ground attack has averaged just 120.8 yards in SEC contests this season after last season's Western Division champions averaged 261.7. Kerryon Johnson rushed 32 times for 167 yards in Auburn's 40-17 thumping of Georgia last November, but he was held to 44 yards on 13 carries three weeks later when the Bulldogs won the SEC title game 28-7. Johnson bypassed his senior season for the NFL and is now having a stellar rookie year with the Detroit Lions, while four of Auburn's starting offensive linemen from a year ago had to be replaced as well. "We were very inexperienced coming into this year up front, and we had new running backs," said Malzahn, whose Tigers rushed for just 19 yards against Texas A&M. "I think it's still a process." In Malzahn's four trips to Sanford Stadium as either Auburn's offensive coordinator or head coach, the Tigers have not scored an offensive touchdown after the first quarter. The Tigers have lost all four of those games, with two of them blowouts. Redshirt freshman JaTarvious "Boobie" Whitlow leads Auburn with 642 rushing yards and has averaged 5.9 yards per carry, but he has battled shoulder and leg injuries and may not be at full strength, which was the case with Johnson in last year's SEC title game. Whitlow rushed 19 times for 170 yards last month in a 31-16 win at Ole Miss, and the Tigers came within 11 seconds of splitting the possession time with the Rebels. "It's a lot about what kind of team you are," Georgia coach Kirby Smart said of possession time. "If you have depth defensively, and you think you can withstand those drives, the most important thing becomes, 'Can I get off the field on third down?' Auburn teams have been different over the years, too. They've had really fast-scoring offenses, and they've had some long, methodical teams that go on long drives. "It's a lot more important what we do than what they do, and we have to go execute regardless of what they do." Auburn is traveling to Georgia for the first time since the 2016 Tigers entered with a No. 9 ranking and were favored to top the Bulldogs, who were 5-4. Georgia wound up controlling the ball for a staggering 39:09 and pulled off a 13-7 upset. "That helped us a lot that year," Bulldogs senior defensive end Jonathan Ledbetter said. "If you control the ball, you control the game. They've got a really fast team, and when they get going in the groove, it can hurt a lot of teams, because people get tired. They get a lot of defenses that aren't lined up, so you have to be able to stay ready and sustain during moments like that. "If our offense can stay on the field longer and control the game, then they will have less time with the ball and we can limit that. If we're getting three-and-outs, that means the game is flowing how it needs to be."